We all remember Crazy Town and their megahit, “Butterfly.” The song tore up the charts and was in almost every major movie from the early 2000’s and set the band on the track to success. After a lengthy hiatus, the band is back with The Brimstone Sluggers. This is the band’s first album since 2002’s Darkhorse and is just their third album. After a 13-year break it can be hard for a band to regain their stride and make a dent in the music industry- especially in today’s music world. 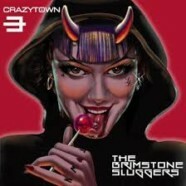 The Brimstone Sluggers shows Crazy Town picking up right where they left off. Sure, “Butterfly” was extremely over-played and is the first thing most people think of when they hear the band’s name but that’s a shame because they had so much more good music and better music than just one song. The Brimstone Sluggers is prime example of that too. The album features the signature Crazy Town sound but shows it upgraded and updated a little bit to fit in better with today’s rock world. There’s not much filler on this album- they came out with guns blazing and this album is almost a statement album for them. After 13 years away, there’s bound to be some doubt among fans about whether or not the band can still throw down and make music that’s both relevant and impressive that can stand alongside the other bands of their style who have emerged and The Brimstone Sluggers proves all of that and more. This is the album Crazy Town needed to make and the album that encapsulates everything the band is all about and ever has been. Will it catapult them to super stardom again? Probably not. Is it a good start? Absolutely. The band has created the strongest of their three albums and, if they keep down this road, they could see quite a bit of success.